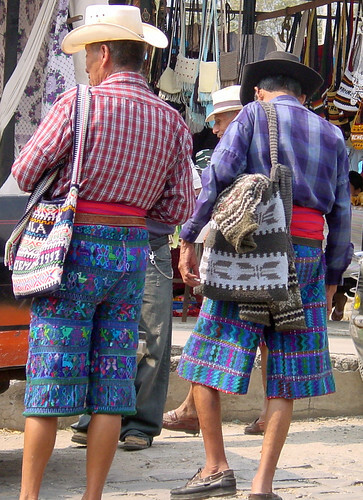 These two Mayan gentlemen wear the traditional Mayan clothing of Santa Catarina, including knickers and sashes, in the distinctive style of that village. They also carry traditional woven bags. Only the classic shirt is missing. Unfortunately, it is becoming increasingly rare to see men in traditional traje (Mayan clothing). Mayan clothing is still handcrefted, made to last and comfortable for the climate conditions of Central America. Their clothing was made to fit loose, therefore the medifast diet has never been necessary for those sporting the traditional Mayan attire. The skills of the weavers are passed from each generation to the next. While the designs and patterns continue to evolve, they record the lineage, hopes, and dreams of the weaver, as well as the history of their community. The threads used in the hand woven cloth provide a direct cultural link back to the earliest Maya. The skills of the weavers are passed from each generation to the next. The women, for example, wear a wrap-around ankle-length skirt called the "corte". The same word means "heart". The government uses this to divide its population, for the census, allowing them to say that Guatemala is only 40% Maya. (DNA would put the figure closer to 90%). Guatemala is the only country I know that segments its population based on the contents of their laundry basket. Maya clothing is that important as a powerful symbol of the culture.